Chrysler Group LLC released images of the new 2011 Jeep Patriot, the affordable compact SUV that offers consumers segment-leading capability and unsurpassed 4×4 fuel economy, along with classic, rugged Jeep styling. Jeep Patriot’s classic exterior styling and capability are enhanced for 2011 with new front and rear fascias, a body-color grille, and an increased 4×4 ride height. Ride-and-handling is refined courtesy of retuned steering and suspension systems. Interior enhancements round out the new-for-2011 features, and include significantly upgraded touch points. New-for-2011 Jeep Patriot exterior highlights include an aggressive new front fascia with standard fog lamps positioned inside the headlamps; a new rear fascia that extends lower than on previous models; a body-color grille; new available 17-inch wheels; four new colors and 4×4 ride height that has been increased by 1 inch. Interior upgrades for the 2011 Jeep Patriot include new soft touch front-door trim panels with a padded upper surface; new center armrest; a new Jeep steering wheel with integrated controls that allow the driver to operate the radio, cruise control, hands-free phone and other vehicle functions while keeping their hands on the wheel; new cloth interior, with premium cloth bucket seats in the front; standard speed control on all models; new backlighting of door switches, door locks, windows and power mirror controls and standard automatic temperature control on the Latitude X model. Available as a stand-alone option on all models for 2011 is the Uconnect® Voice Command with Bluetooth for hands-free calling and music/radio/SIRIUS satellite radio control. 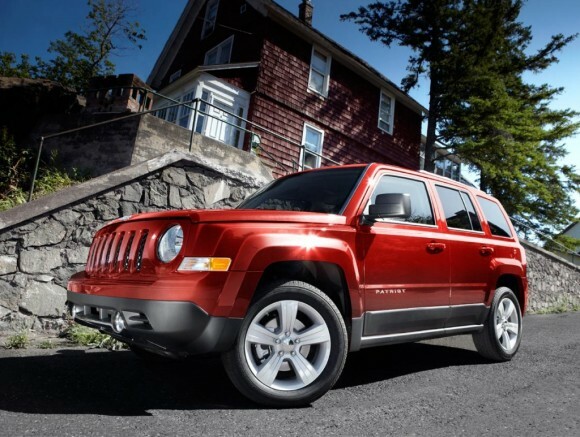 The 2011 Jeep Patriot offers customers more capability than any other vehicle in the compact SUV class. Capability features include low-range mode which generates a best-in-class 19:1 crawl ratio, brake traction control, 19-inch water fording capability, Hill Descent Control, 4×4 Lock shift-on-the-fly which sends 50 percent of torque to front and rear wheels, and a maximum tow rating of 2,000 lbs. The Jeep Patriot also boasts a retuned suspension for 2011, with higher spring and damping rates, added rebound springs, and an increased diameter of the rear sway bar. Despite these numerous capability features, the 2011 Jeep Patriot boasts unsurpassed 4×4 fuel economy in its segment. A 2010 Insurance Institute for Highway Safety (IIHS) Top Safety Pick, the Jeep Patriot for 2011 is loaded with more than 30 standard safety and security features, thoughtful functionality and best-in-class off-road capability with Freedom Drive II, offering tremendous value for consumers that desire an SUV to accommodate their active lifestyle at an affordable price. Offered with front-wheel- or four-wheel-drive, Jeep Patriot is available in three configurations – Sport, Latitude and Latitude X. Built at the Belvidere Assembly Plant in Belvidere, Ill., the new 2011 Jeep Patriot models arrive in Jeep showrooms in the fourth quarter of 2010.